Instrument envelopes can be scaled both horizontally (x-axis) and vertically (y-axis) when choosing “Scale Points...” from their contextual menu. On the x-axis, the envelope points are be multiplied by the factor in the first field in this dialog window. Entering 2, for example, will double the width of the envelope (shifting its points respectively), while 0.5 will halve it. You can also increase or decrease the values of the envelope points by scaling the y-axis in the same way. A factor of 2 will double the values (expanding the envelope up) and 0.5 will halve the values. Due to their nature, the pan and pitch envelopes (the latter only when not being used as a filter envelope) have their x-axis centered; this means that entering values greater than 1 will increase the panning / pitch range of the envelope, values less than 1 will decrease it. You may also use negative numbers for the y-axis scaling factor, which will flip the envelope vertically. After scaling, a vertical offset may also be applied to the envelope. 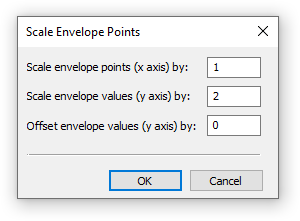 This shifts the scaled envelope up or down by the specified amount of envelope units. This page was last edited on 9 December 2018, at 20:39.